A unique guest book alternative which gets the guests involved and is admired by all. Please read the product description below for more details. 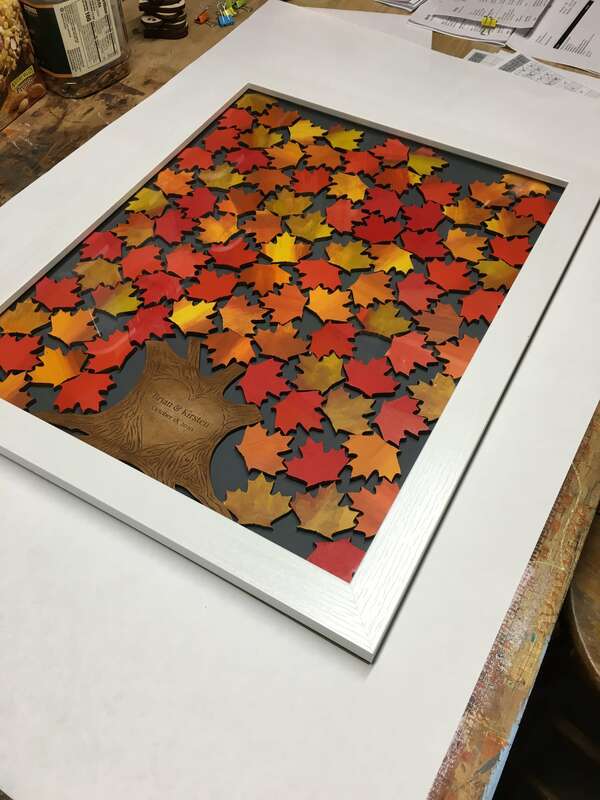 Frame Size Choose an option8"x10"11"x14"14"x16"16"x20"18" x 24"
Leaf Size Choose an option1.5"1.75"2.0"
Write the color you’d like the backing to be. You can choose any color. Instead of the blank wood leaves, we’ll paint them fall colors, as seen in two of the pictures. The text you want engraved on the personalized piece. Anything in parenthesis will be considered a symbol or icon. For example John (heart) Becky will have a heart shape engraved and not the text. 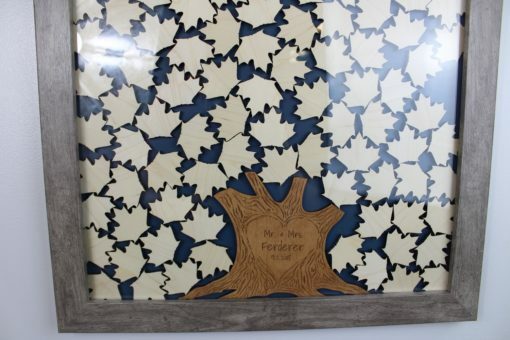 A unique & personalized, wedding tree drop top guest book alternative that is sure to be adored by all. 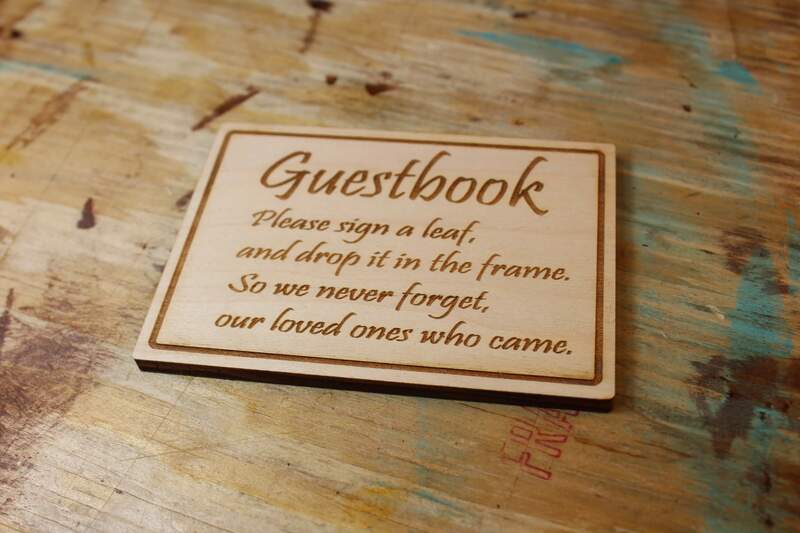 This drop box guest book is an exciting and warm way to involve guests at any event. Whether it’s for a wedding, baby shower, graduation, fundraiser or any other event with sentimental value, the guests will enjoy signing and dropping a leaf through the slit at the top of the shadow box frame, where they can be cherished for a lifetime. Please take the time to read the following to ensure you get exactly what you’re looking for. EACH FRAME CAN HOLD A DIFFERENT AMOUNT OF LEAVES. 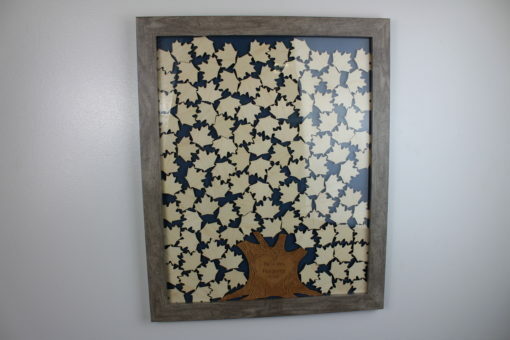 The main item pictured is 16″ x 20″ with 100, two inch sized maple leaves. 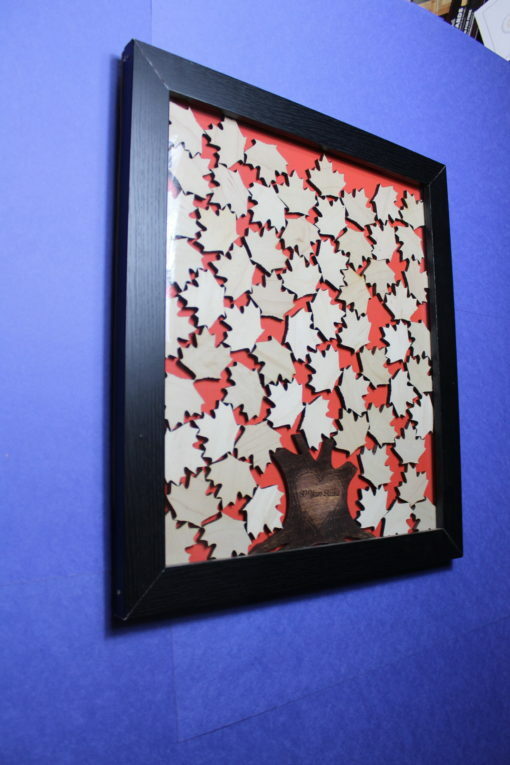 There are 3 different sizes of leaves, allowing each frame size to hold a different amount. The larger leaves obviously allow more text to be written on them, and you should choose the size you prefer depending on what you are going for. There are 1.5″ leaves, 1.75″ leaves and 2″ leaves (see picture). 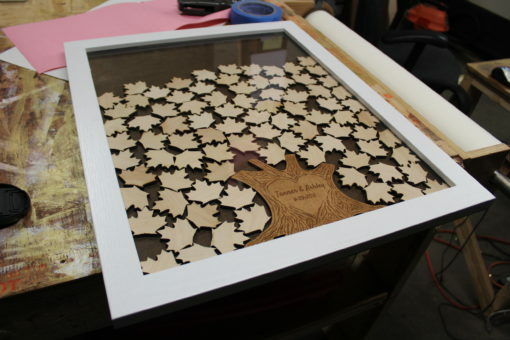 The larger size of leaves, the less t he frame will be able to hold of that size. The 1.5″ leaves are a good size for just a name or two, but not much more. Maybe a name with a smiley or a one or two-word blurb, or a very small drawing. The 1.75″ leaves hold more text. A great size for multiple names (often the choice of signing by couples). Also a name with a longer blurb and/or small drawing. 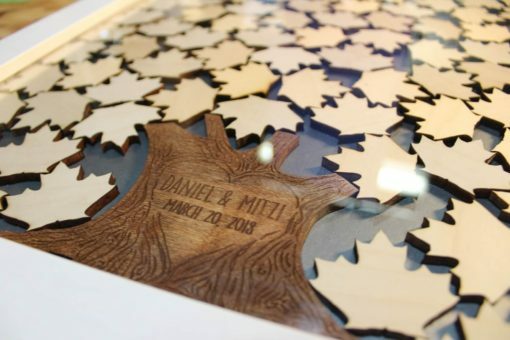 The 2″ leaves have even more room and are great for allowing guests to leave a short message along with their name. Remember, most guests at events like weddings will fill out one piece as a pair if they’re with a date. 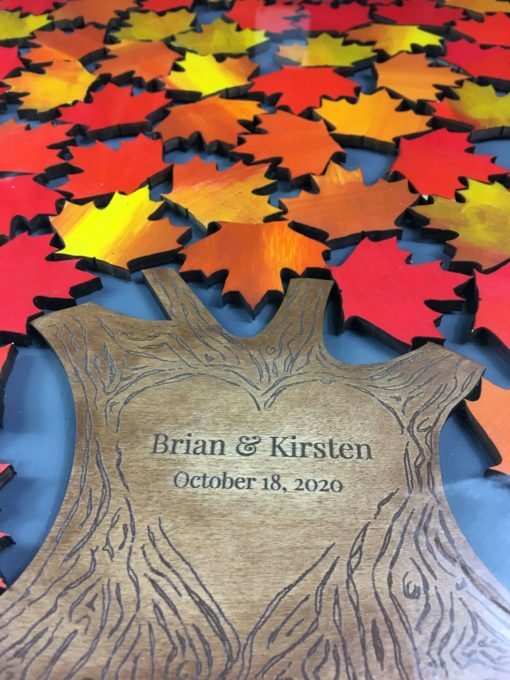 So if you plan to have 150 guests at your wedding, unless you make a point that each guest should sign a piece individually, you should expect less than 150 signed pieces. Therefore, we suggest 1.75″ or 2″ leaves with a frame which will hold 90-125 pieces. 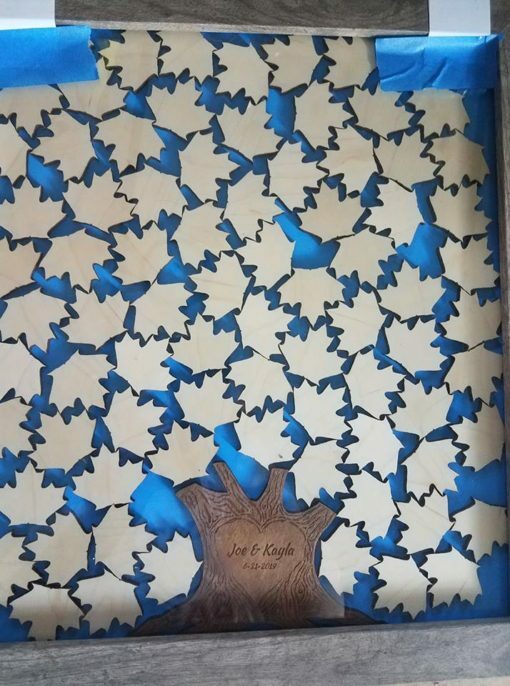 Of course, it’s impossible to know for sure how many pieces will be signed. For something like a kid’s birthday or graduation, we suggest getting close to around exactly how many guests you plan to have. Each kid will want to sign his own. The size of leaves you want. 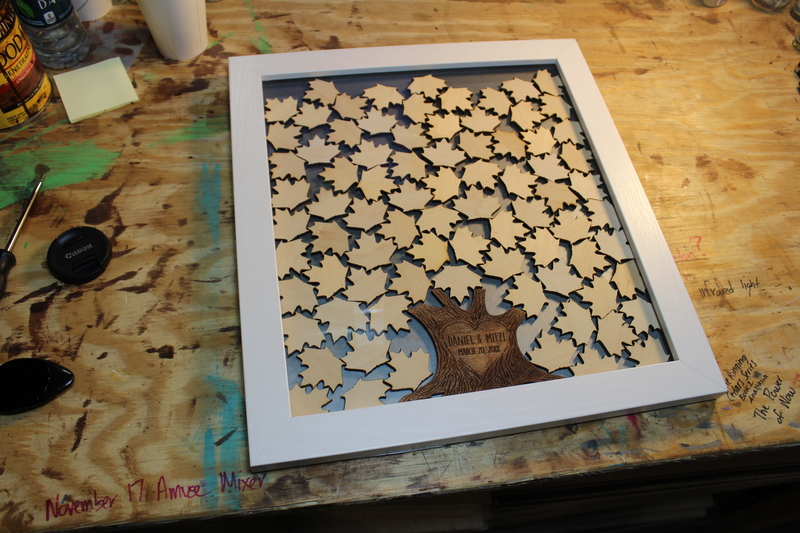 The amount each frame holds of each size leaf is fairly accurate but it may hold a few more or less. Exactly what you want engraved. In the case of the main item pictured, this would be “Daniel & Mitzi March 20,2018” You may also choose something like “Mr. & Mrs. Avery June 14, 2016” or “Thomas (heart) Lindsey 4-25-19” Anything in parenthesis will be considered an icon or symbol. 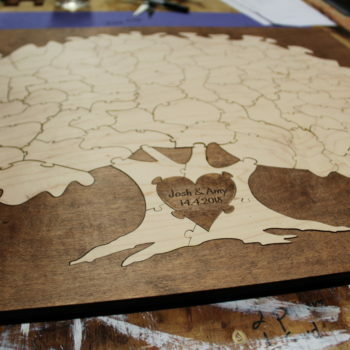 Whatever you choose, we will design and engrave it to look as best as possible. A name and a date will be on two centered lines of text, something like Mr. & Mr. with a last name and date, we put on 3 lines of centered text. This looks and fits better. Let us know in the order notes if you prefer the text laid out in a different way and we will accommodate. The font you prefer. There are 12 separate fonts you can choose from which correspond to a letter and are seen in one of the images. If you don’t clarify any font, we will choose one. We can also use free to download fonts. Just include the link where it can be downloaded in the notes section during checkout if you want a separate font. 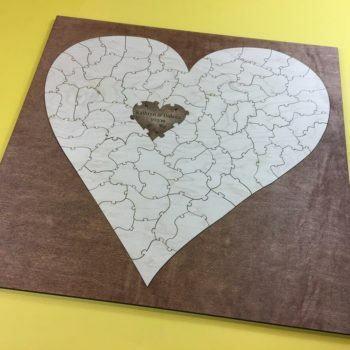 The background color will be natural brown (hardboard) unless you specify a color. There is no extra charge for a colored background. 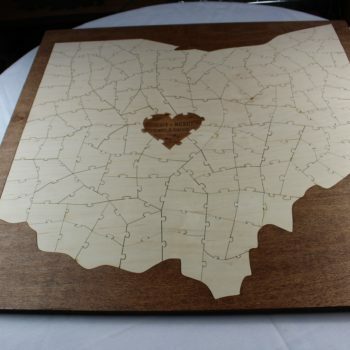 The interior pieces are made of 1/4 inch thick maple wood. The front cover is glass. The tree trunk piece with the names engraved on it has a dark brown finish added. 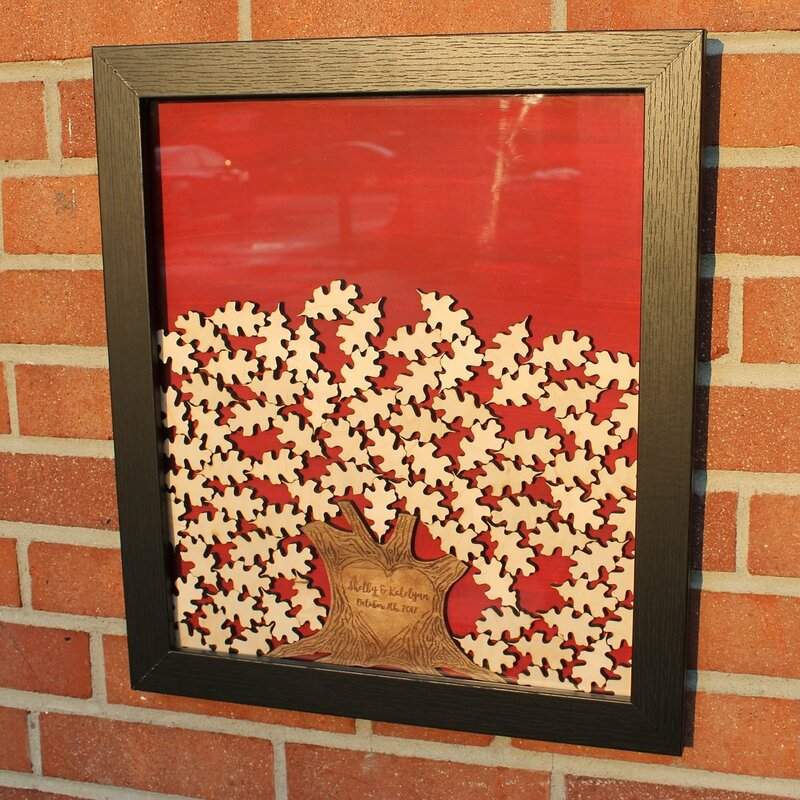 There is a hanging mount attached to the backside, so the frame can easily hang on a wall. 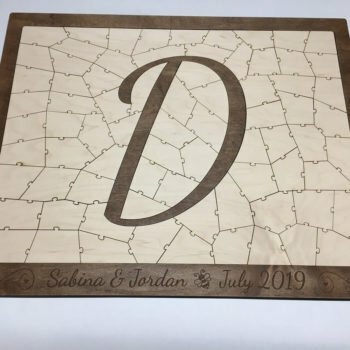 We will include the engraved on wood instruction sign for free, in return for a Facebook share Just let us know in the notes section what name you’ve liked the facebook page with, and that you agree to share a picture either on Havoly’s facebook page or on your own paging tagging ours. You can also share us on instagram with @havolydesigns and #havoly. This is a great way to support small business, we truly appreciate it! 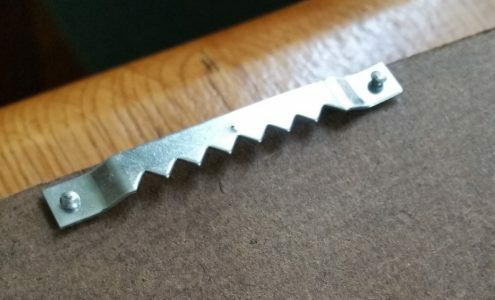 We often post a collection of your shared pictures every month or two. We also offer other alternative event guest books. 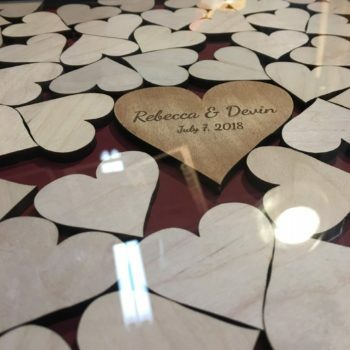 There is similar heart drop top guest book, which has an engraved heart centerpiece with heart shapes that are signed and dropped in. We also make puzzle guest books, in a variety of styles. We work very hard to ensure only high quality items reach our customer’s hands. This is evident by the perfect reviews we have received for this and other items; most of which can be found on our Etsy shop. 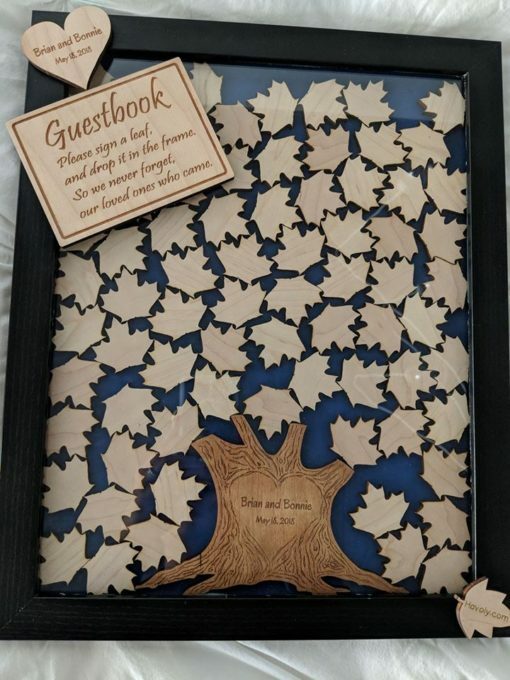 8"x10", 11"x14", 14"x16", 16"x20", 18" x 24"
Absolutely in love with my tree top guest book! couldn’t have asked for better or faster service! Perfect for the theme of my wedding! Perfectly crafted and Casey’s customer service is amazing! thanks for answering questions prepurchase! This exceeding my expectations! 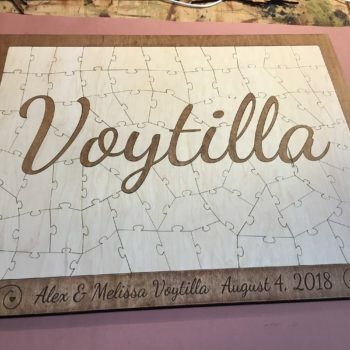 I am so glad I stumbled across this company and their products, I can’t wait to display this for our friends and family for our wedding in Oct 2019! Pick will come to follow (: Thank you Havoly!